In this Thursday Therapy episode, Glenn Mackintosh teaches you what tapping is, explains pioneering research on Emotional Freedom Techniques for weight management, and outlines how EFT can help you with weight loss and maintenance. Hi everyone, welcome to Thursday Therapy. The question we’re answering today is about tapping. Hey guys, welcome to Thursday Therapy. It’s Glenn Mackintosh, the weight psych. Guys, thank you for all your tapping questions, I get asked tapping questions all the time and when I put it out there that I wanted one for Thursday Therapy I’ve got lots. So, I’m actually going to answer three of them I’m going to take you through tapping for weight management 101, we’re going to look first at what is tapping then we’re going to look at some of the research on tapping and what you can use it for so let’s get started. The first question comes from Kat. Kat asks, “What is tapping and how can we use it to stop food cravings and help with weight I’m nineteen months post sleeve surgery my restriction is slowing and I think I need to start using a variety of strategies?” Great question Kat and we’re actually just completing a trial of tapping for post bariatric surgery patients, so watch this space on that one. Tapping is also called emotional freedom techniques, psychological acupuncture, or EFT for short, and to answer your question about what it is, it’s a unique exercise combining focusing on a problem, with tapping on acupressure points. o, how we use it for food cravings is someone comes into my session and they bring one of their usual suspects, either chocolate or chips or lollies or cake, whatever it is, and what we do is we focus on all of the elements of that problem. It might be beliefs around the food, memories around the food, it might be the taste and texture, it could be the type of emotions that it makes them feel or the type of emotions they’re dealing with to eat that food, all of these elements which would typically raise the craving and then we tap on the series of acupressure points and the person can just feel the craving release, then and there. It’s really freaky. The tapping is the newest of my therapies, I’ve only been doing it for about three or four years and it’d be only the last few months that I’ve stopped being surprised with how well it works. It works with almost everyone and it’s actually not dependent on the placebo effect, so if you’re willing to give it a go, often you’ll be surprised with the results. So, how does tapping work then, well to be honest, I’m not an expert on the Chinese medicine side of things, I don’t know too much about balancing out your energy flow or your meridians, but what makes sense to me, as a Western trained practitioner, is that we actually know that tapping has certain effects on your brain and reducing the reward and pleasure centre activation when you are exposed to these foods. So, we’ve actually done up a little animation a while ago to help you understand this and we’re going to include that now, so you can see how tapping works. Inside our brain we have a part called the amygdala, which is about the size and shape of an almond and this little part of our brain is really important as it allows us to sense threats and sets off our important fight-or-flight mechanism. Luckily these days, we don’t get chased by sabre-toothed Tigers. Our stresses are more likely to be chronic lower level stressors, like work issues, time pressure or family life. While short bursts of amygdala activation help us when we’re in real physical danger our amygdala does not work as well when it’s constantly firing. We experience a range of uncomfortable emotions, we can’t think as clearly and as a result we don’t make the best choices. 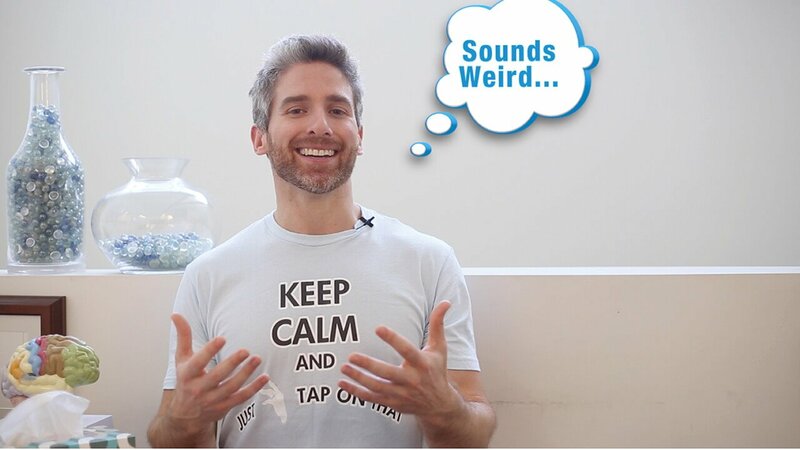 Amazingly the tapping technique has been shown in laboratory brain scans to send a calming signal to the amygdala and this is why when you tap, you end up feeling calmer. When the fog of amygdala activation lifts you can also think more clearly and make better choices about everything. Interestingly, the tricky amygdala also plays a central role in our reward and pleasure pathway. It’s a vital part of our brains addiction centre, so when you see a chocolate drive past your favourite takeaway or it turns one time your amygdala lights up. Fortunately, as tapping calms your amygdala, it all so powerfully reduces food and drink cravings. This often means you don’t end up feeling like eating or drinking those foods and drinks at all after you tap. But the coolest thing is the tapping actually deactivates the amygdala, so when you are exposed to the cues that would normally excite it, it remains in a calm state. Ground breaking University trials found tapping for food cravings work better than CBT, as the reduction in food cravings lasted longer. In fact, a year following tapping therapy many people in the trials actually forgot their most crave foods and no longer ate them at all. Through normalizing the activation of the amygdala, tappers feel better, make better choices about eating, drinking and physical activity and as a result end up weighing less without any harmful dieting. So, now you know a little bit more about how tapping works, it leads really well into our next question from Loretta, who asks, “Is there research stating that it actually works?” Great question Loretta. We did touch a little bit on the research in the animation but I want to talk to you about it in more detail because the research is actually how I got into tapping. So, for years people have been saying to me, Glenn you have to try it tapping and I’ve been giving them the polite response, I’ve been saying look it sounds really interesting but as of yet there’s no research to show that it works in my area of weight management and in my mind, I’d probably be thinking, well that’s a bit of a weird technique, as a lot of people do it’s quite a novel type of intervention. But then I read Peters research trial and it was the first research trial on tapping for food cravings and the results were quite amazing. Firstly, what we found was a reduction in food cravings and that reduction in food cravings lasted at least a year after therapy, so that was pretty cool. Secondly people felt better which is really cool. Thirdly, which is really important for my work, people felt like they had more willpower, so they felt as if they were more in charge of food choices rather than food being in control of them and we also saw some weight loss but there are some really interesting things we saw about weight loss. Most weight loss programs and we’ve talked about this before, show this Nike swoosh of weight loss where the weight goes down then comes back up often with interest but in Peters trial, it was a short month-long trial where people came for four two-hour sessions, and they lost just a little bit of weight over the course of that trial period. But then when we measured them at 6 months, they actually lost more weight, which is really interesting. That’s unlike most programs which show weight regain shortly after the treatment finishes, but then it a year that actually lost more weight, the average person had lost five and a half kilograms and that’s quite exciting because to get significant weight reduction with just that treatment, the people in the trial asked not to do any other weight management treatment, so it’s pretty much just about the tapping, that’s pretty cool, but when I see weight loss, a little part of my amygdala, kind of goes off and I worry whether people are becoming more dieting. We know we’ve talked about this before as well, but when we get diet it leads to a whole bunch of problems including weight regain later on, but what this trial showed is that people actually become less “diety” so the results of this study were just amazing to me. What’s even more amazing to me, is that Peter and I got together and developed an online version of tapping for weight management and we’ve ran a clinical trial with over 600 members worldwide and we found that we can get the same results through online tapping, so you can do tapping at home and get all of these benefits yourself. So, what can you use tapping for apart from food cravings, let me answer the next question and we can talk about all of the areas that you can use tapping for, to help you free yourself from weight management issues. Joe asks, “I only like certain veggies. Only a few and I’d like to introduce more variety into my veggies. I know how to fix cravings but can we use tapping to add veggies we don’t like?” Awesome question Joe. People know that tapping can be super powerful for food cravings but what we’re finding in our latest research is that it can be actually used for almost every area of weight management, so what I want to do is I want to talk you through the tapping topics that we use in our online program because obviously in our online program we’ve chosen the most relevant areas and that way you can see what areas you can apply it tapping to, but I also want to talk you through our online program because we’ve got our first group that’s not part of a trial, so the first group that you can join, we’re calling it tap your way into summer, and it starts on October the 10th. So, let me talk you through what we do in the tapping program, that way you can understand how you use tapping for yourself and you can understand the benefits of the program that you can join along and tap with us. We start off with doing an intro to EFT, and we actually find that in our programs there are a lot of people who already know a bit about EFT but still learning from Peter, who’s one of the world’s leading expert, people still pick things up. Then we get into tapping on food cravings which everyone knows is probably the most powerful part of tapping, then we get into tapping into more fruit and veggies. So, yes Joe we can use it for more fruit and veggies. We actually find that people who eat more fruit and veggies tend to naturally eat less of the other stuff anyway. Following that we do a two-week course on tapping around emotions. Some research suggests that up to 70% of our extra eating is due to emotions, so we go through the whole range of emotions and tap our way through those, so you don’t have to eat your way through them. Then we get into tapping for physical activity, this is one of my favourites as a sport and exercise psychologist and we help you tapping away all the barriers to you being regularly physically active. We then move on to tapping for drinks, so tea, coffee, alcohol, water, some of these things can go under the radar but we actually find that a lot of people in our clinical trial find this super and surprisingly useful and then we finish off on tapping into mindful eating. We’ve spoken about mindful eating before and it is really closely linked with long-term success with weight management, so we help you tap away any barriers to mindful eating. So, these are some of the things that you can use tapping for and I’d really love to extend to you a special offer to join our tap into summer program, if you’re in the northern hemisphere, you can tap into winter that’s just fine we’d love you to join us. It really does mimic our online trial that we’ve done, there’s so many bonuses, you get tapping scripts, so you can do extra tapping, dozens and dozens of videos for you to tap along with, plus Peter and myself do extra support through our closed Facebook group, so you can ask us a whole bunch of questions and as usual I want to give my Thursday Therapy people a discount. So, if you want to join up for that program and we would love to have you use code GMACK for 10% off and we’ll see you tapping your way into summer. Guys thank you for paying attention to Thursday Therapy. I hope that it’s helped you walk a little bit of the journey that I’ve walked into understanding the research and the power behind this really amazing technique and I also want to ask one more thing from you, we’re so close to about 500 subscribers, so if you see anyone that you know that you can tag or share this video with, we’d really love to get over that 500 subscribers mark and of course if you haven’t subscribed already, subscribe for regular Thursday Therapy with me and until I see you in our next session, happy tapping. Hey Buddy!, I found this information for you: "EPISODE 14 What is tapping (and can it help me lose weight?)". Here is the website link: https://www.weightmanagementpsychology.com.au/episode-14/. Thank you.